INCLUDES RETURN ADDRESS AND PARTY THEME ON ENVELOPE ROLL OVER (?) for example. Name of Child, Age, Date, Time, Address of Party, RSVP and any other info. 12 2" Printed Circles Punched for You. Roll over (?) for example. How Do I Print My Own? 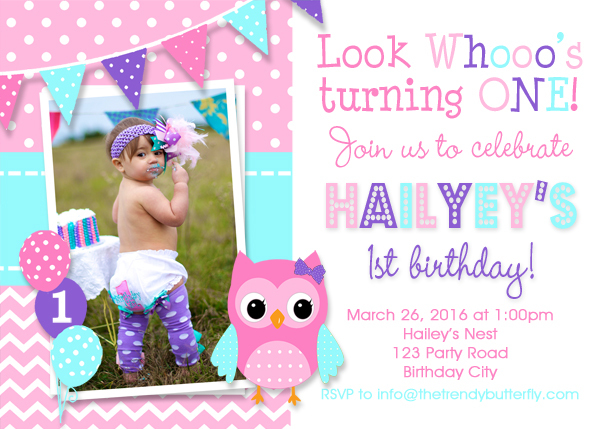 Invitation by The Trendy Butterfly! have us print for you! Click tabs to the right for more information. Wording, hair color and invite colors can be changed to make a truly custom party invitation. Please contact us before ordering. Custom Invitation work is welcomed, contact us for more information. Super fast and super easy! Once you order your invitation or any printable file, we will work on your order and send it to your email within 24-48 hours. When you receive your file(s), we ask that you carefully review and let us know if any changes are needed. Once approved, you are ready to print!! This is a fantastic way to make your event special!! Cupcake Toppers - Print on white cardstock, use a 2 inch circle punch to punch out circles. We suggest getting lollipop sticks and hot glue them right onto your circle. Goody Bag Tags - Print on white cardstock or full sheet 8.5x11 white sticker paper, use a 2 inch circle punch to punch out circles. Either stick directly onto your goody bag or hole punch and tie with a cute ribbon around your item. Food Tent/Buffet Cards - Cut and fold in half. Water Bottle Labels - Ideally , if you can print on 8.5x11 water resisitant sticker paper. Or you can print on white cardstock, cover cardstock with clear heavy duty shipping tape then cut and stick to water bottle. You do not want the ink to bleed, when it gets moist. Chair/Yard/Center Signs - Print right on your white 8.5x11 carstock, center piece signs. If your design is a circle you will have to cut. You can then hot glue right onto your display. All of our professionally printed items including, invites, thank you's, banners, toppers etc... are printed on 120lb smooth finish cardstock. (with the exception of our water bottle labels, which are printed on water resisitant sticker paper). All invites and thank you's come with blank square flap blank envelopes. Let us print your return address as well as party theme on the front of your envelope - this makes your invite standout and is just adorable! 1. Once you order, we will send a proof for approval to your email within 24-48 hours. (Please review all content). 2.Once you approve your proof please allow 1-3 business days for production. We will then mail to you via USPS Priority Mail. 3. We can print all your party items including, banners, sticker tags, toppers, water bottle labels etc..
Cupcake Toppers - You will receive your toppers already circle punched. We suggest getting lollipop sticks and hot glue them right onto your circle. Water Bottle Labels - Peel and stick, they are already printed on Water Resistant sticker paper. Chair/Yard/Center Signs - Print right on your white 8.5x11 carstock, Center Piece signs if a circle you will have to cut, you can then hot glue right onto your display.